June | 2010 | I made that! We all have our lists of things to be done in life, mine just happens to involve a lot of food. I’ve been wanting to confit my own duck legs since I first tasted it in Scotland (I know, unlikely location) 10 years ago. I knew it was relatively easy, I had several recipes and I had watched other chefs do it at work. I just never seemed to remember to get some duck meat for myself. While at the farmer’s market a few weekends ago I saw a sign advertising ducks for sale and well, all signs pointed to me hunting for copious amounts of duck fat. Luckily a chef friend who regularly confits keeps the fat around and offered it on loan. And now I had no excuses. So I began the meaty journey that is duck confit. First step: Seasoning the duck and letting it soak up the flavor for a day or two. Then the fun begins. I rinsed off the seasonings and placed the legs in a container large enough to fit them comfortably. Then I covered them in that glorious duck fat. I brought them to a simmer on the stove and then popped them in the oven to poach for 6 hours. Let me just say that there are few things better than spending the day bathing in the smell of duck. I was worried at first that after a few hours I would be turned off, but no, it only made me want to tear into that meat more. Once the ducks were cooked (they fall to the bottom of the dish when done), I took them from the oven and let them cool to room temperature. Some of them I was using for dinner that night while the rest were going to be stored in the fridge for future use. And they were magnificent. I braised them with lentils and bacon for friends and there wasn’t a drop left. I think I’m gonna be making this quite often. – Sprinkle ducks with salt and place in a dutch oven or deep pan. Using a mortar and pestle, crush the peppercorns and clove and scatter over the duck along with the sliced garlic. 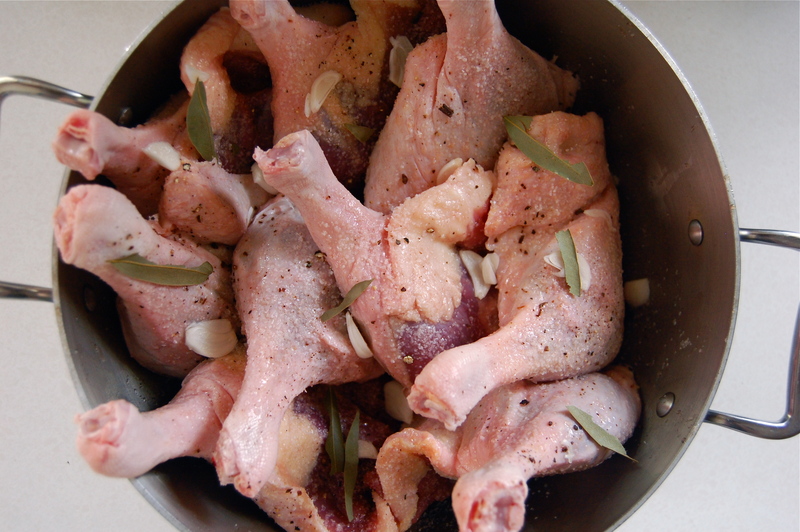 Press a halved bay leaf onto each duck leg. Cover with plastic wrap and refrigerate for 24-48 hours. 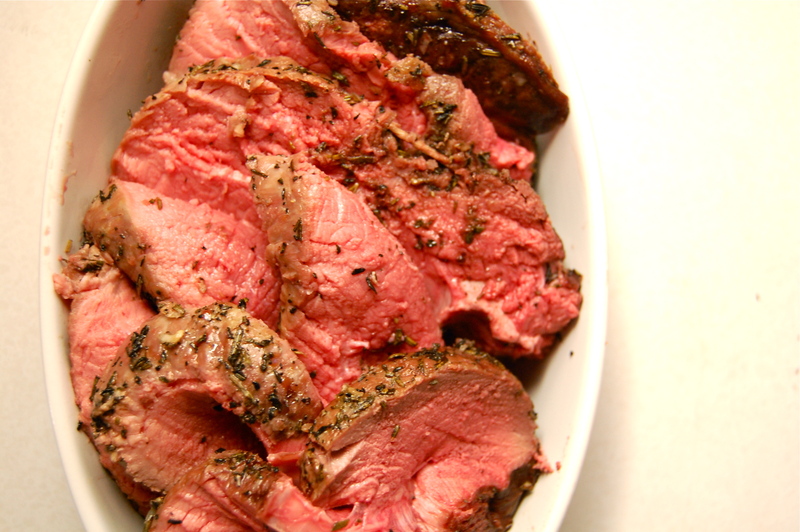 – Rinse duck under cold water to wipe off seasonings. Pat dry and place back in dutch oven. – Preheat oven to 180°F. Pour duck fat into dish, completely covering duck. Bring to a simmer over medium high heat. Place, uncovered, in the oven and cook for 6 hours, until the duck is tender and has settled on the bottom of the pan. – Remove from the oven and cool completely. Gently transfer duck legs to a dish for storage. Cover the duck with the fat until completely submerged. Seal with lid or plastic wrap and refrigerate overnight or up to one month. 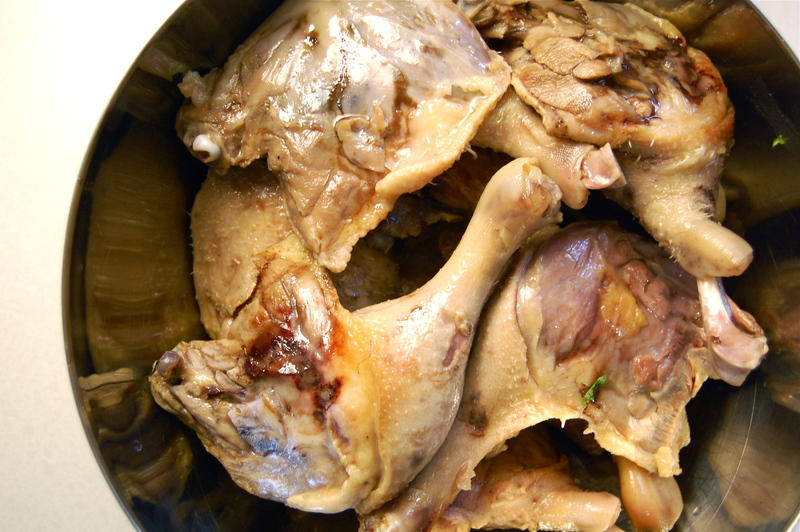 – When ready to serve, remove duck legs from the fat (this will be much easier if you first warm up the fat). Place skin-side down on hot skillet and let skin crisp on medium heat until golden brown. Turn duck over to brown bottom and to warm meat through, about 5 to 7 minutes. Serve crisped duck confit immediately. – Cook bacon over medium heat in a large dutch oven. Remove from pot and place on paper towel. Remove all but 2 TBSP of the bacon fat. 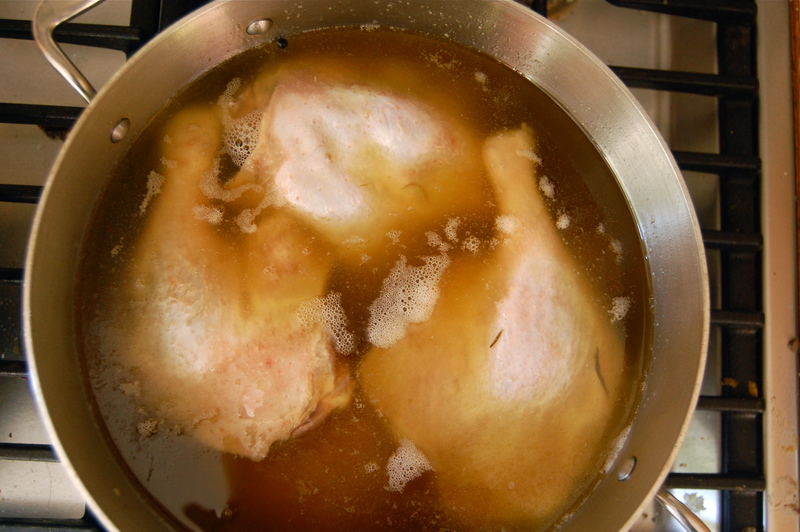 – Sear the duck legs until the skin crisps and browns. Remove from pot and set aside. – Cook onions and carrots in the bacon fat (add more if necessary) over medium heat until starting to become clear. Add garlic and cook on minute longer. Add the red wine and simmer over medium high heat until reduced by half. 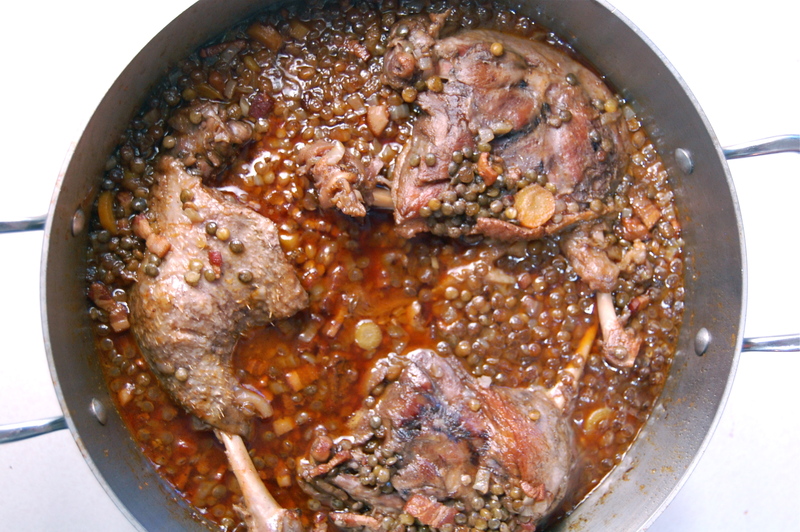 – Add the stock, lentils, tomato paste and thyme and cook over medium heat for about 15 minutes. Stir in the cooked bacon and nestle in the seared duck legs. Cover and cook over low heat for about 1 1/2 hours. The meat should be very tender. You could also cover it and bake it in a 325 degree oven for the same amount of time. So this week I started to crack. After weeks months of me sticking up for Seattle, begging for patience, CONVINCED that summer is just around the corner and that when it arrives everything in life will work itself out like a freshly fluffed pillow. Remember when I wrote about spring vegetables and how I was gonna cheat and buy Californian because I was just so impatient and well, Washington peas would be just a few more weeks, right? And telling my family “No, wait to fly out to visit for summer, when the weather is fantastic.” Well, today was summer solstice and it seriously felt like winter. We JUST got local peas. And I’m still waiting on a reliable source of tiny sweet strawberries so I can take the rhubarb dessert off the menu. I kept telling myself “it will warm up in time for solstice, we’ll totally be able to eat on the porch.” There was no porch-eating. There were however, some peas. So we decided to just go with it. If Seattle wants it to be winter, then dammit we’re cooking winter food. 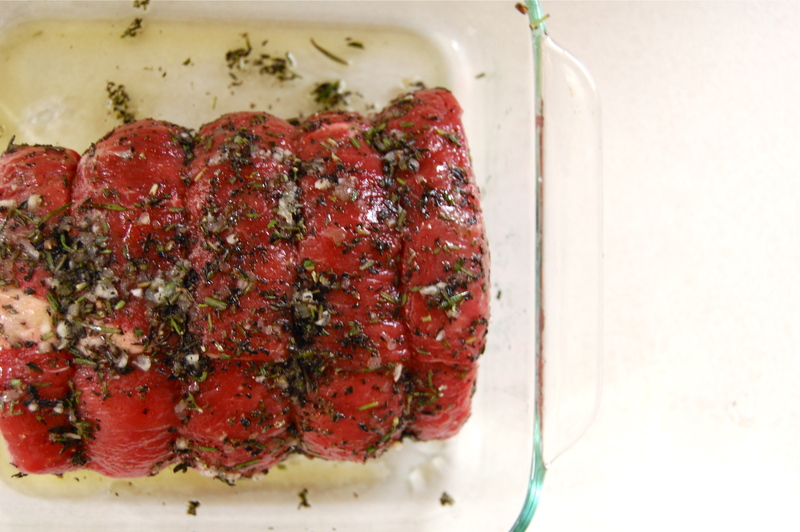 A pretty little beef roast seasoned with garlic and herbs. Sliced into yummy little medium rare pieces. And there was gravy. And buttery mashed potatoes. And freakishly delicious fresh peas just barely boiled and tossed with butter and tarragon. But most importantly, there were Yorkshire puddings. Somehow, like the much-later-than-it-should-be summer, I was the last person on Earth to know about Yorkshire puddings. I mean, I had heard of them, I just didn’t take them seriously. We didn’t grow up eating them, and from the photos I had seen, they just looked like dinner rolls. And what is up with the British calling everything a pudding? Let me start at the beginning. There was a batter, a very simple batter of flour, salt, pepper, eggs and milk. It needed to rest, so I made it an hour before I was ready to use it. After the roast beef was finished serving time in the oven I cranked up the heat and spooned drippings into a muffin tin. I popped the fat slicked pan into the hot oven and let it sit until the drippings were boiling and crackling. I filled up the little cups 1/3 of the way with the batter and back into the oven it all went. 25 minutes later and I was head over heels in love with these little guys. How to even begin to describe them? They souffléd up so tall and proud. Yet, for all that muscle they were as soft as pillows (second pillow reference of the night, I must be sleepy…). They were SAVORY! 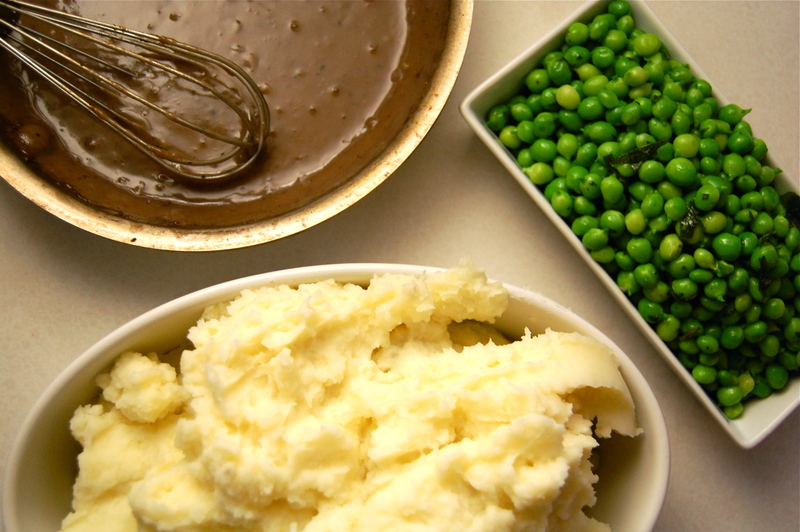 The flavor of the beef fat was all there, and with some gravy spooned over them, oh. my. god. I ate three. Do yourself a favor and make these. I suspect I will be eating them quite regularly. I’ve been looking for a way to use up my left-over bacon fat! – In a large bowl, combine flour, salt, and pepper. Make a well in the center, and add eggs and 1/4 cup of the milk. Using a whisk, combine eggs and milk, then incorporate flour; begin with the inner rim of the well. 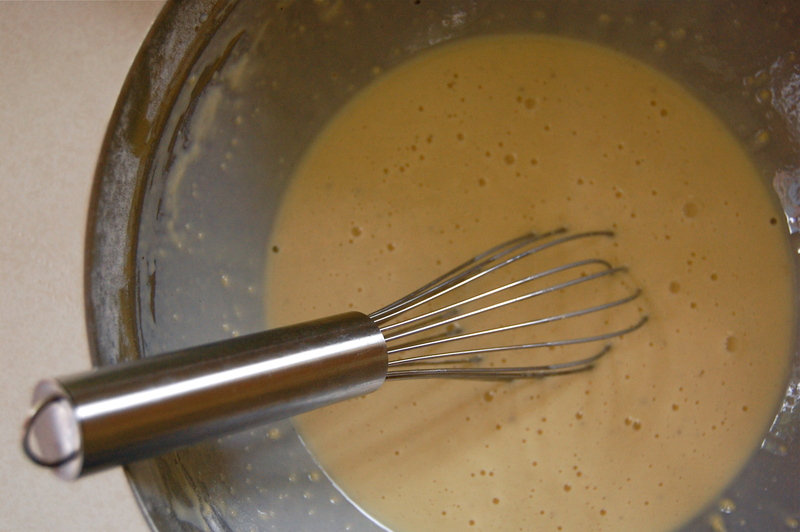 Continue whisking until a smooth, stiff batter forms. – Stir in half of the remaining milk. 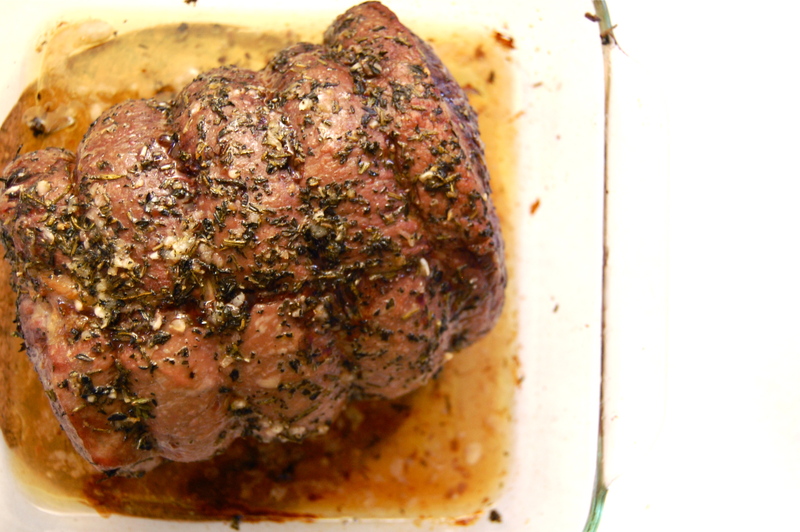 Cover with plastic wrap and let stand at room temperature for 1 hour. – Heat oven to 450 degrees. 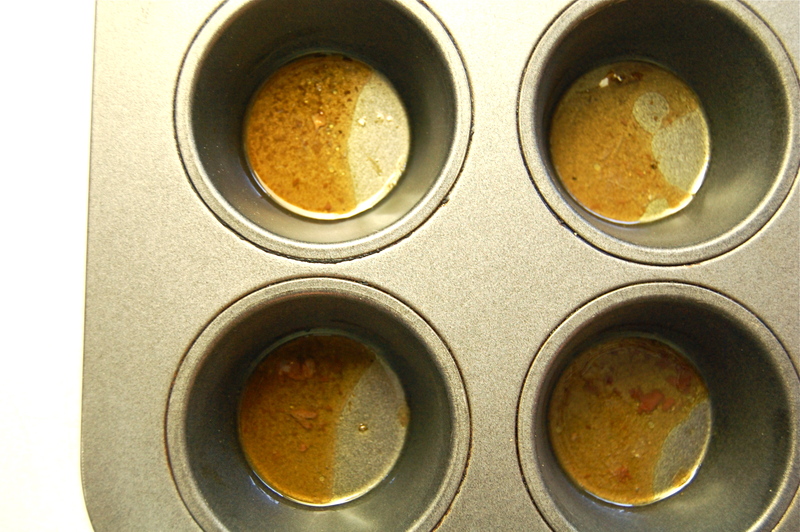 Transfer 1 to 2 teaspoons of drippings into each cup of a muffin tin. Put the pan in the hot oven until it starts to bubble. – Stir enough of the remaining milk into the batter until it is the consistency of heavy cream. 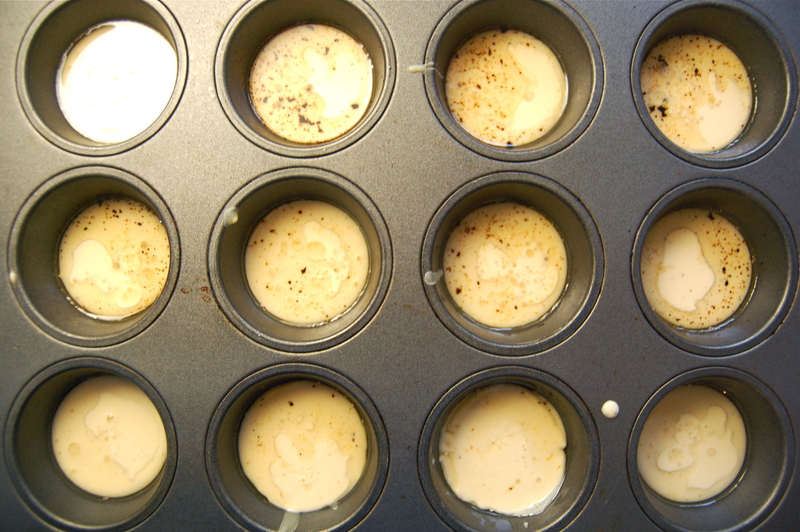 Pour batter in the muffin tins, filling them about one-third full; the batter should sizzle in the hot drippings. 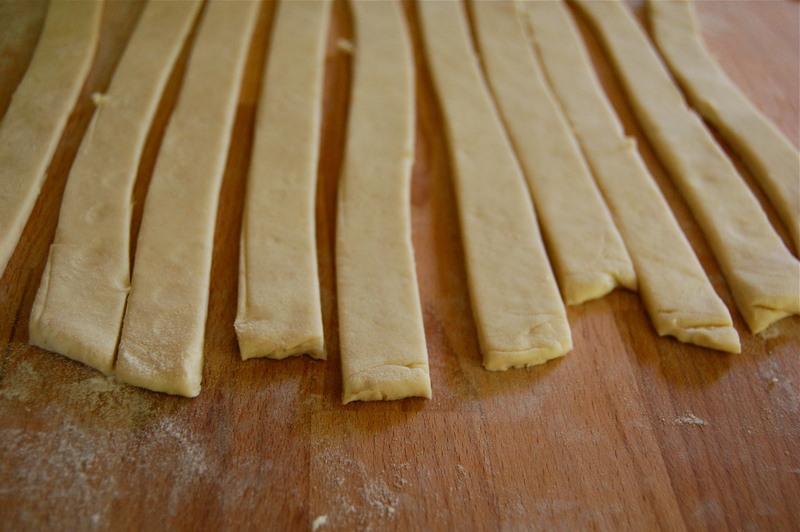 – Return to oven and bake until puffed, browned, and crisp, 25 to 30 minutes. 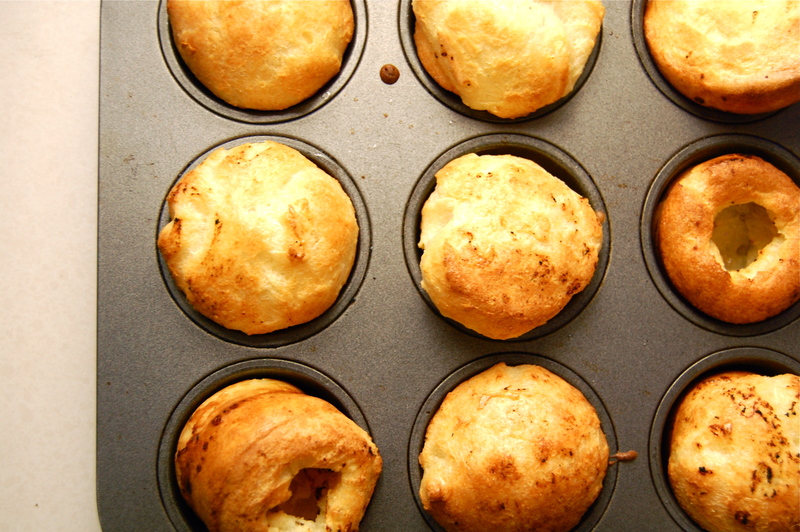 Yorkshire pudding is best served fresh from the oven, but it can be kept warm in a low oven for about 15 minutes. And so it begins. I know, we’re a bit late, but fruit has finally arrived in the Pacific Northwest. 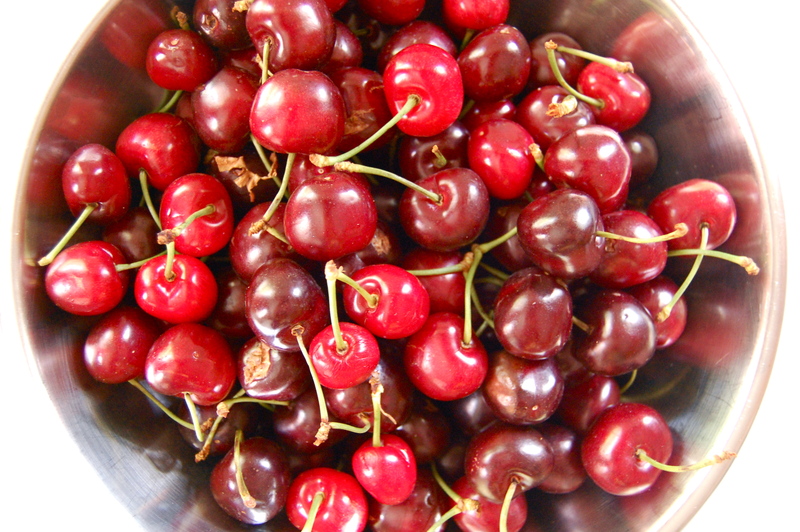 Every year I await with relish the first bloodbath of cherry pitting. Somehow I always forget just how messy it gets and stain everyone and everything within arm’s length of the kitchen. But having my kitchen look like a killing floor is a small price to pay when you’re fruit-starved in June. A visit to the Ballard farmer’s market left me carrying 3 lbs of local cherries (along with some of the teeny-tiniest sweetest little strawberries!) and I was determined to make pie. Because, well, it has just been too long. 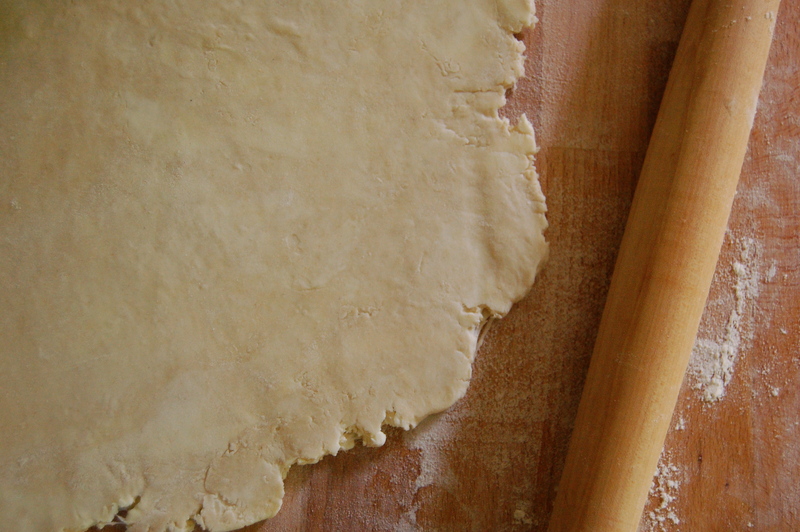 As with any pie, I started with my dough. I wanted to make a lattice top, so I decided to use the smear technique (more detailed instruction here) for my pâte brisée dough. 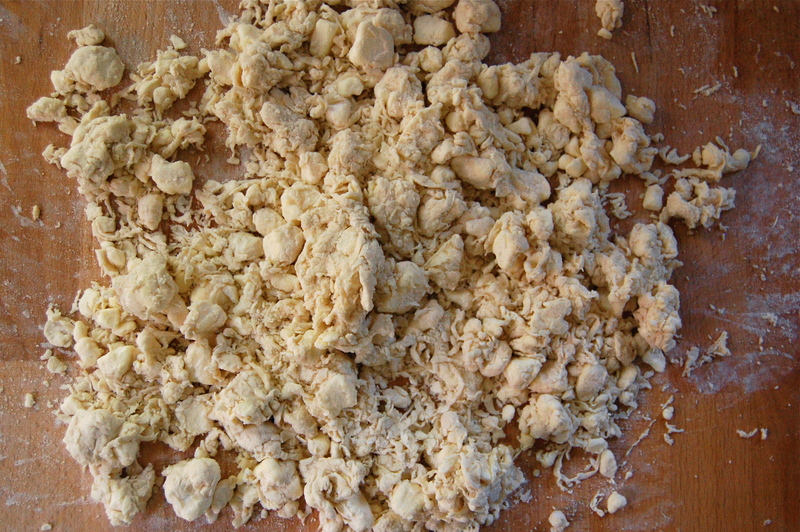 This dough gives plenty of flake without all the puffing up of a laminated dough. I was pleasantly surprised at how quick pie-making has become for me. I have faint memories of spending all day on one pie and feeling it was too prized to eat. Now I can dig in knowing that if I run out, I can just make another! 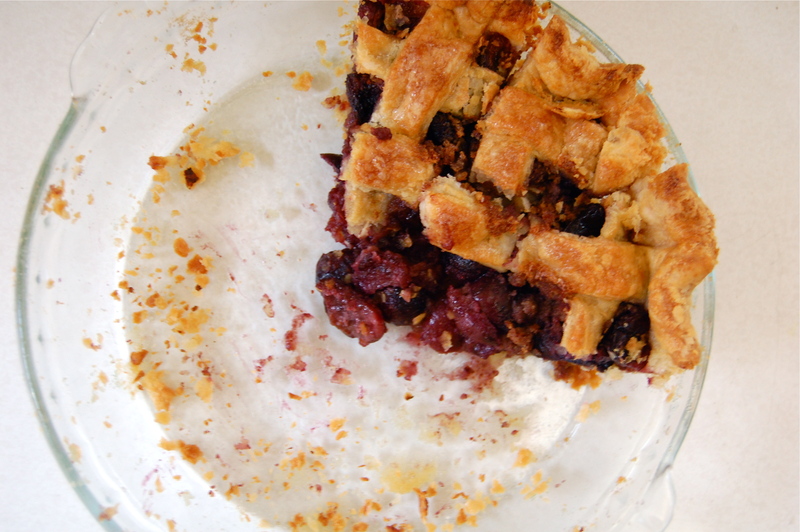 Since cherry and almond are like peanut butter and jelly (and Pantea’s favorite, this pie is for you!) I whipped up some frangipane to spread on the bottom crust. Then I loaded her up with cherries. And got to work on some strips for the top. 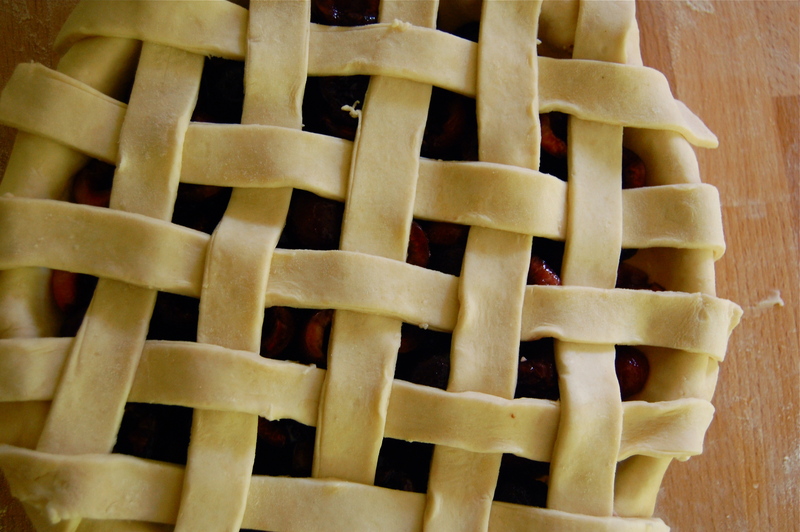 It was my first time making a lattice top and now I can’t imagine what took me so long to try. So much pretty for such little effort! 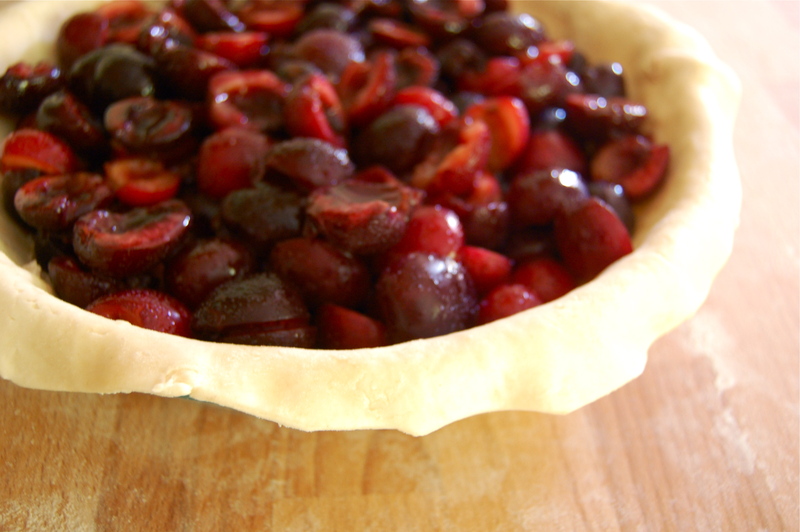 I want so badly to have a beautiful picture of a perfectly baked cherry pie. Unfortunately we tore into this pie so fast I forgot to document! 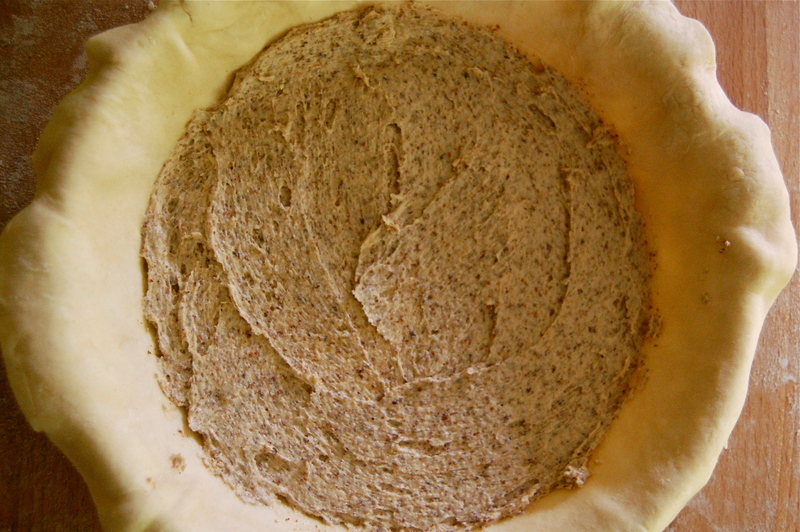 It was a lovely first pie: flaky crust, yummy almond undertones. My only complaint would be that the cherries were just not quite there. Hopefully they’ll sweeten up in the next few weeks. Rumor has it that all the fruit west of the Cascades is waterlogged this year, so it’s going to be a hunt for the good stuff. If anyone can recommend great cherry farms, please share! In the meantime, I’ll be gorging on those teeny tiny strawberries. But you can’t take the boiled peanuts away from the girl! Every time I go back to Montgomery to visit the friends and family, I have a few stops that need to be made. I need to buy a book at Capitol City Books in Old Cloverdale, buy a copy of Garden and Gun magazine at whatever southern airport I land in, eat a Chick-fil-a chicken biscuit sandwich. But the most important stop is to buy a bag of boiled peanuts from the guy selling them on Old Selma Road. It’s usually my first stop since he lives down the street from my grandmother. Every time I tear through a bag I remind myself to make some when I get home. The problem is that boiled peanuts are traditionally made with green peanuts, and I have no idea how to get my little paws on those. So while visiting Bama and purchasing my bag of gold last week, I asked the guy that makes him where he gets his. He informed me that he just uses the dehydrated ones you can find anywhere, since the green ones can mold so easily. So there. There was nothing stopping me. So I made some. 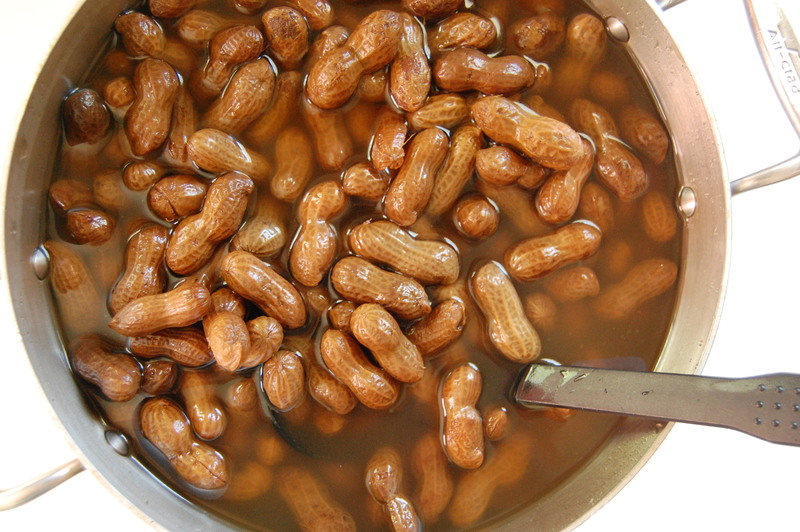 To be honest, I’m not totally sure the appeal of boiled peanuts transcends nostalgia. So far most every non-southerner I’ve forced them on has reacted either indifferent or confused as to why I like them. Supposedly they’re hip in Brooklyn right now, so maybe that means their popularity will make it to the West coast sometime next year. But I don’t have to wait, because now I can just do it myself! And it is SO easy. All you need is time. And some peanuts of course. There’s no real magic to these guys, you just load your peanuts into a pot of salty water and boil away. The hardest part is waiting for them to cool before dipping your hand in for a bite. 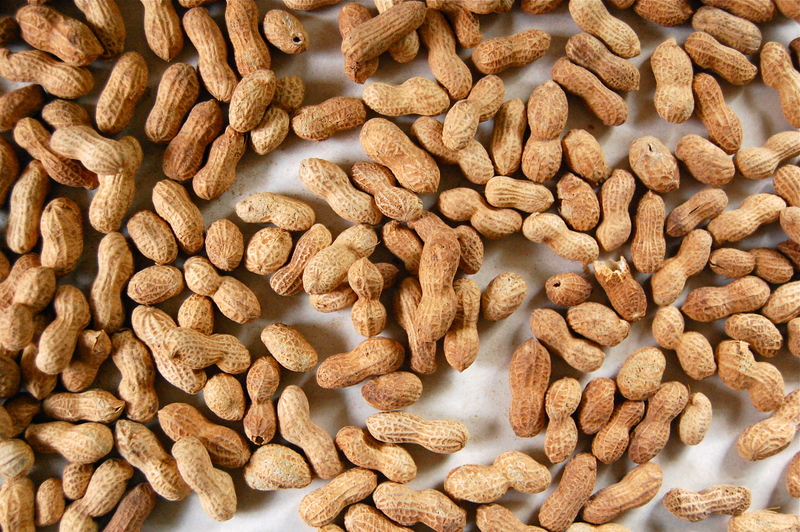 – Rinse the peanuts to remove any dirt. – Place in a large pot and cover with enough water to cover by an inch (you’ll need to press the nuts down to measure because they like to float). Add the salt. Cover and bring to a boil. – Once boiling lower to a medium simmer and keep going for about four hours. You’ll want to check in every now and then to see if more water needs to be added. After four hours, taste one. The shell should be soft and pliable and the nut should taste strongly of the salty brine. If not, keep going until it does. – Once finished boiling, turn off the heat and let the nuts sit in the brine at room temperature for a couple hours. Dig in and store whatever is left in the brine in the fridge. I’m not sure how long they COULD last, but if you’re from Alabama I doubt that will be an issue.